Here are some ways we at Steppingstones can help you and your company/organization benefit from the Internet. We have our own fully-managed, dedicated, high-performance server in a secure data center in Houston USA. The server is only available to our clients for which we host and operate Internet websites and related applications. All of the server data is backed up offsite 4 times daily. We have also implemented many other security features to make sure that your data is fully protected and never lost. Affordable housing application and tracking system, including an online property listing and management application. We have expertise with the Joomla CMS and have plenty of experience in customizing, enhancing and extending this open-source content management system. This allows us to provide affordable software solutions and quick turnaround. 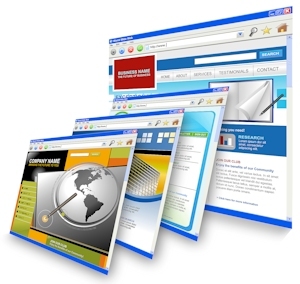 Using a CMS allows our clients to fully manage and update the content on their websites. An Internet strategy is a lot more than just having an e-mail address and a company website. An Internet strategy means developing and implementing an integrated and comprehensive set of activities that maximize your marketing efforts. It means selecting and using those components of the Internet to complement your regular marketing to achieve your company’s goals. We can assist you to plan, write and put into action an Internet strategy that makes sense and that will achieve results. Since we also do business plans, we will make sure that your Internet strategy is consistent with the directions and goals of your business plan. If necessary, we can also do the necessary market research (surveys, interviews and/or focus groups) to help you develop a strategy that meets the needs of your customers. Searching and registering a domain name (or you can do it yourself). Providing you with a complete hosting package. Conducting a needs assessment/feasibility study among your staff and your clients to determine the most appropriate functions and features for your site. Designing, programming and testing your web site. This includes the preparation of any graphics, photographs and special interactive features such as guest books, order forms, etc. Setting up an affordable e-commerce component to your website so you can take on-line orders. Registering your web site with the appropriate search engines and directories so your customers can find you. Helping with on-going maintenance and updating – websites needs constant attention to ensure they are working, secure and all features are operating as they should. Using our research expertise and experience, we can assist you to evaluate the effectiveness of your website and/or your marketing initiatives. A properly done evaluation will show you what is working, and what needs to be changed. Our past evaluations have included analyzing traffic patterns, comments in guest books, focus groups (live and on-line), detailed surveys of customers and analysis of results. A comprehensive evaluation report is part of our service. Your investment for a professional evaluation will be money well spent.